I am a huge fan of sweet potatoes, it just does the trick for me. 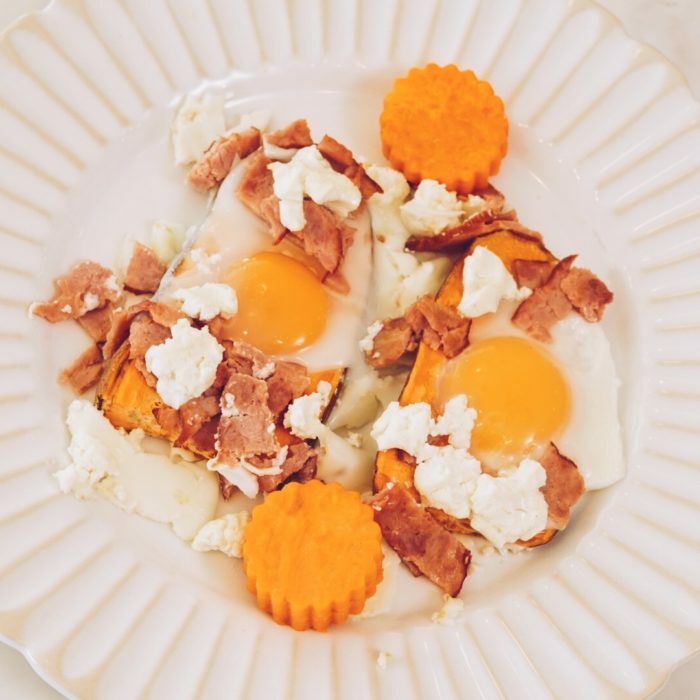 Here with an egg, some turkey bacon and goat cheese, it is so delicious and makes the perfect breakfast or brunch. Preheat the oven at 425F. Wash the sweet potatoes and slice them lengthwise, about 1/2 inch thick. With 2 large potatoes, it should make 5-6 good slices. Brush with olive oil on a baking sheet and place in the oven for 10-12 minutes. Remove from the oven and cut a small circle in the middle of each slice. Crack an egg in each hole, sprinkle with some cut turkey bacon, goat cheese, salt and pepper. Return to the oven and cook for another 7-9 minutes until the white is set but the yolk is still smooth and runny! Add some more salt and pepper to taste and enjoy!! !